LAS VEGAS — What's in store for the hotel room of the future? According to the pulse of this year's Consumer Electronics Show, the word is plenty. CES 2018 was mostly about the Internet of Things — the connectivity between things that can be managed not as much by one cool app or one responsive control module, but by the user, whose preferences, wants, dislikes and habits can be known well before ever stepping into the room. A partnership between Legrand, Samsung and Marriott is in the works with a plan to roll out what may be the world's smartest hotel once plans go into motion by the end of this year or beginning of next. The rooms will be showcased across a chosen brand of the Marriott Corporation in an opt in program by property owners. And when the curtain parts, guests will be treated to a new tier of personalization in hospitality that has never been seen. Legrand, based in Limoges, France, is a $6 billion developer of power, light and data systems for residential and commercial buildings specializing in myriad smart switches, outlets, presence sensors and much more that make a smart building possible. Its part in creating the room of the future is centered on lighting that responds to what the room knows about the guest and what it senses in the guest's movements. Components will integrate intuitive lighting and voice-activated controls developed as end-to-end IoT services on the Samsung ARTIK platform and the SmartThings Cloud. Legrand's Wattstopper architectural dimming platform is designed to meet precise dimming and energy conservation objectives while providing enhanced end-user experiences. These elements will interface with other sensors so that, for instance, a guest gets up in the middle of the night to use the restroom and at the point where feet touch the floor, soft lights appear to show the way. 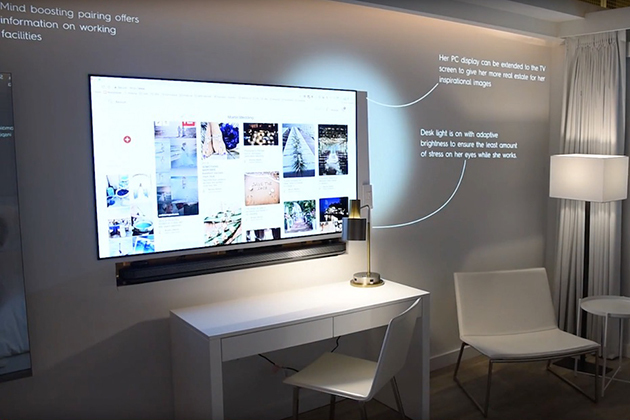 "There are switches, plugs, thermostats, even curtains to be considered, and we are integrating all of the elements of the room with such a level of connectivity that by just putting a key in the door and coming into the room the room will know who you are," says John Kalkman, Vice President IoT Business at Samsung. Marriott will make a brand choice based on what guest personas may best fit the new technologies — whether it will be a younger set that is comfortable and even expects such technological conveniences in the hotel experience or older or more traditional guests that stand to be wowed. "The concept is so full of possibilities," says Nancy Snyder, senior manager hospitality sales electrical wiring systems for Legrand. "This was one of those dream scenes in which you get a lot of smart people in a room and you start throwing out ideas and then you end up with a list of amazing visions that may actually have solutions. "You can, for instance, have the heating or air conditioning running before you get to the room or you can let the room know you will be returning at a certain time. When you turn on the television, your stations will be lined up. Maybe you like a certain color or a certain kind of art — all that can be arranged. We have designed a mirror that also tells you the weather, offers alerts and messages, is interactive as your personal concierge." The hotel IoT space is not for wows only, says Snyder. There are government mandates requiring commercial developments to integrate power elements that shut down when not in use. And although the creating of whole hotel IoT is expensive and complex, once in place, hotels will have the ability to save money through the various modes of power conservation involved. While Marriott has committed to the new IoT designs and looks to launch within a year, other properties and brands may also be in the offing. "We are having many conversations," says Snyder, naming some top business and leisure hotel brands. "It's the future."